Everything went perfectly to plan for Peterborough Panthers as they created their own slice of history last night (March 24). The city team didn’t just celebrate a successful start to their 2017 season by beating Scunthorpe 51-42 at the East of England Showground, they also triumphed in the first-ever SGB Championship meeting to take place in the process. The newly-named second tier looks set to be ultra-competitive in the coming months, so the fact the new-look Panthers team functioned exactly as expected will have been particularly encouraging. It’s a septet which was assembled with strength-in-depth in mind so the fact that five of their riders out-scored their averages was pleasing on a night when Panthers led from start to finish. “It was a brilliant performance from everyone,” insisted team boss Carl Johnson. “We were solid all the way through from one to seven and that was the intention when we put the team together. “We had guys winning races for us and also managed to pick up the valuable seconds and thirds, while keeping the number of last places down. “It’s a nice little bit of history for us to have won the first SGB Championship meetings and a good result in the first league meeting will give the lads confidence. While it might have been a pleasing all-round performance from Panthers, no-one was more impressive than skipper Ulrich Ostergaard, who top-scored with a paid 14-point haul which was the perfect way to silence those who questioned his return for a fourth successive season. The former second-tier riders’ champion experienced a rare dip in form towards the end of last term, but he looked as if back to his best when following up a trio of second places with wins in the final two races. His triumph in heat 14 sealed Panthers’ success on a night when they led from start to finish. Ostergaard again took the chequered flag in the finale to ensure Scunthorpe were not able to grab the 5-1 that would have earned them a consolation point. New recruit Paul Starke brought up the rear in the last instalment, but he earlier reeled off a hat-trick of heat wins to launch his Peterborough career with a double-figures haul of 10+1. 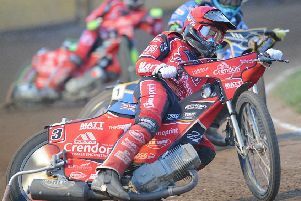 Fellow winter captures Kenneth Hansen and Jack Holder claimed two heat triumphs apiece while British prospect Tom Bacon contributed three points from as many rides in the number seven berth. His haul would almost certainly have been greater had referee Mick Bates not been so quick to slap on the red lights in heat two when Scott Campos tumbled out. The Scunthorpe reserve guest was already in the process of getting to his feet to clear the track when Bates halted the race a split-second after the turn two incident. Panthers were on a 5-1 at the time with Bacon leading the way and partner Bradley Wilson-Dean just about to seize second spot from Campos despite starting from a 15-metre handicap for missing the initial two-minute call. Bacon also led for two laps of the re-run until Austrian ace Fritz Wallner eased round to register victory in his first-ever outing at Alwalton. Wallner also took the flag in an eventful heat six as Panthers pair Holder and Simon Lambert saw an early 5-1 position turned into the same outcome for the visitors. Of the other two Panthers men, reserve recruit Wilson-Dean was certainly consistent as he reeled off five successive third places. The valuable points were exactly what Panthers wanted even if the rider himself was rather underwhelmed about his performance despite meeting his average. Simon Lambert dipped just below his expected mark with four. However, the man who stages his testimonial at parent club King’s Lynn this Sunday, was in a scoring position when he slowed with bike problems in his final ride. That came in heat 10 as former Panthers ace Michael Palm Toft cashed in a tactical ride to halve the visitors’ deficit from 10 points to just five. Palm Toft was a predictable star performer for the visitors back at his old stomping ground and had the honour of being the highest-scoring rider on show with that double-points effort helping him to 15. Scunthorpe certainly weren’t easy for Panthers to shake off despite losing the services of Lewis Kerr following an awkward heat seven spill that left him nursing a wrist injury. They also saw Carl Wilkinson hit the deck on two occasions and Wallner walk away from a heat 14 spill. The two teams meet again next Sunday (April 2) at the Eddie Wright Raceway. PANTHERS: Ulrich Ostergaard 12+2, Paul Starke 10+1, Kenneth Hansen 9, Jack Holder 8, Bradley Wilson-Dean 5+3, Simon Lambert 4, Tom Bacon 3. SCUNTHORPE: Michael Palm Toft 15, Fritz Wallner 9, Ryan Douglas 7+1, Josh Auty 5+1, Carl Wilkinson 5, Scott Campos (guest) 1+1, Lewis Kerr 0 (withdrawn). 1 - Holder (59.7), Wilkinson, Lambert, Douglas. 4-2, 4-2. 2 - re-run Wallner (62.4), Bacon, Wilson-Dean (15m), Campos (fell/exc). 3-3, 7-5. 3 - re-run Palm Toft (61.2), Ostergaard, Starke, Kerr. 3-3, 10-8. 4 - re-run Hansen (62.0), Auty, Bacon, Campos (15m). 4-2, 14-10. 5 - Starke (61.0), Ostergaard, Douglas, Wilkinson (fell). 5-1, 19-11. 6 - Wallner (62.8), Auty, Lambert, Holder. 1-5, 20-16. 7 - re-run Hansen (62.6), Palm Toft, Wilson-Dean, Kerr (fell/exc). 4-2, 24-18. 8 - Wilkinson (62.7), Lambert, Wilson-Dean, Wallner (fell). 3-3, 27-21. 9 - Starke (62.4), Ostergaard, Auty, Wallner (ret). 5-1, 32-22. 10 - re-run Palm Toft (62.3), Holder, Wallner, Lambert. 2-7, 34-29. 11 - Douglas (awarded), Hansen, Wilson-Dean, Wilkinson (fell/exc). 3-3, 37-32. 12 - Starke (63.7), Wallner, Campos, Bacon. 3-3, 40-35. 13 - Holder (62.1), Douglas, Hansen, Auty. 4-2, 44-37. 14 - Ostergaard (63.3), Palm Toft, Wilson-Dean, Wallner (fell). 4-2, 48-39. 15 - Ostergaard (63.1), Palm Toft, Douglas, Starke. 3-3, 51-42.